If you’re not familiar with color blocking, you’re missing out on a fun, vibrant way to express your style personality. Color blocking involves using “blocks of color” in your outfit to create a bold, eye-catching look. The look is most effective and flattering on women over 40 whose skin tone tends to cool and grey with age, because vivid colors uplifts and revives your skin’s appearance. 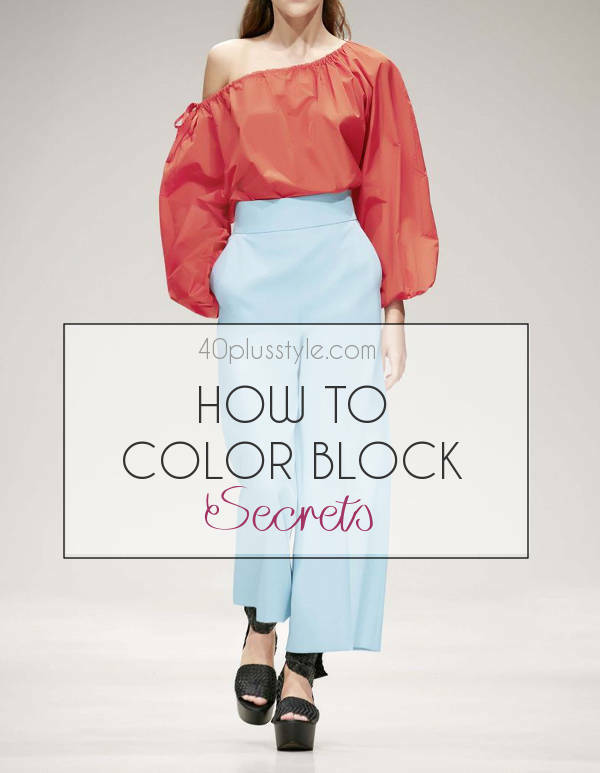 Here is your guide to how to color block your outfits and my secrets to easily mix and match colors. To get started, take a look at Pantone’s Summer color trnds for the season. This color chart covers spring (first row) and starts to intensify and become more vibrant for summer (second row). When I look at the color chart, I get inspired right away. And this is how it all starts. Choose a couple of your favorite colors to combine. I like Flame and Pink Yarrow or Lapis Blue and Primrose Yellow or Niagara and Pale Dogwood would be fresh. To color block monochromatically, pick one color and layer different shades and tones of it. 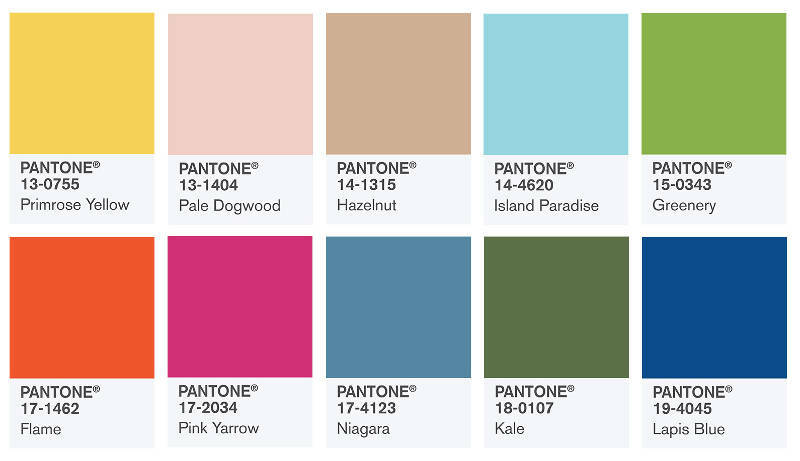 If you go back to the Pantone color chart, you can combine Lapis Blue and Island Paradise (blues) or Kale and Island Greenery (greens) or Pink Yarrow and Pale Dogwood (pinks or reds). Now look closely at the 2017 Spring/Summer runway images above from Hermes (left) and Tibi (right). I love how each designer went monochromatic but also made it interesting by mixing up the fabrics and textures. I see matte and shiny and soft and vibrant. Take inspiration from this by also mixing the textures in your monochromatic color block outfit by using woven with silky or monochromatic pattern with solid or pleating with leather or suede. This Michael Kors look from the 2017 Spring/Summer runway shows how colors from the same color family combine nicely. I especially like the idea of adding a pattern or print in the tones to tie it all together. If you’re wondering how to mix colors in this way, I’ll share this: I learned my secret to organizing colors in second grade. Remember your rainbow color order? 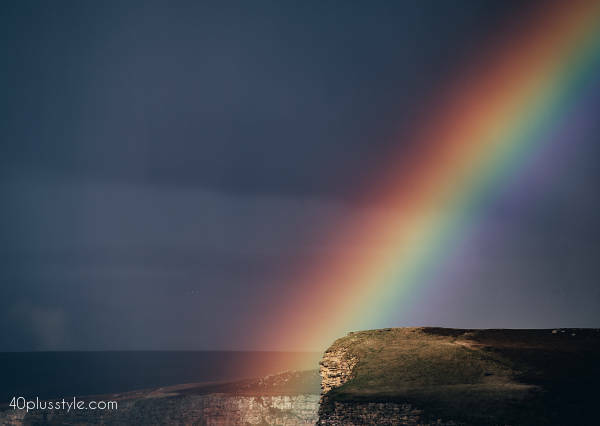 If you look at a rainbow, the colors flow as purple, blue, green, yellow, orange and red. Use the rainbow as your guide. All purple, blue and green shades are in the same “family” or end of the rainbow. Yellow, orange and red are the other side (including pink). When color blocking this way, choose one side of the rainbow family and have fun. And now that you know my rainbow color theory, what color could you add to the Michael Kors outfit? If you said red or yellow, you’ve got this! If you want to get adventurous, choose colors from opposite ends of the rainbow. For example, blue with orange. Or red with purple. This one is tricky, so be careful how you mix these very opposite colors! A good rule of thumb is to choose a saturated color and block it with a softer shade of the opposite color (instead of 2 bright rich opposites). Unless you are trying to replicate the 1970s. A perfect example from the color chart above would be Lapis Blue (bright) with opposite Pale Dogwood (soft or muted). 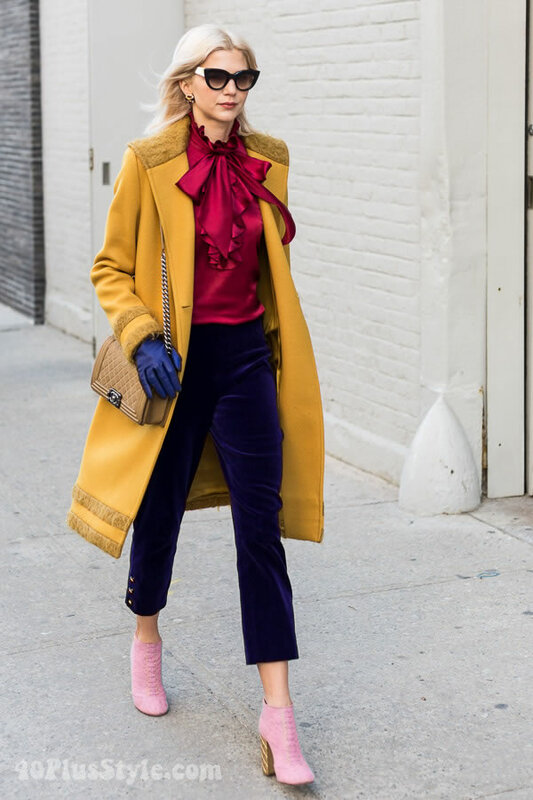 At the 40+ Style Club we work intensively with a small group of women on color, accessorizing and theories like color blocking. The two ladies above are Style Club members Natalie Sandore and Karen Daniel. These are the two color blocking outfits they posted on the Member Facebook Group for feedback. Their looks are spot on! I personally think that what makes these outfits so successful is that they stuck with two colors and layered their outfits with accessories that reinforce their color choices, like the scarf and handbags. And they chose a third, neutral color for their shoes that wouldn’t compete with their outfit. Use at least 2 colors. If you want to start off slowly, use one bold color in your outfit and the second bold color in accessories. Add a neutral like black, grey, tan or white to the mix, like Style Club members Natalie and Karen did. Layer at least 2 separates to color block. A dress plus jacket, or pants plus top plus scarf and/or cardigan. Choose the brightest, most flattering color as your top to accentuate and enhance your gorgeous face. 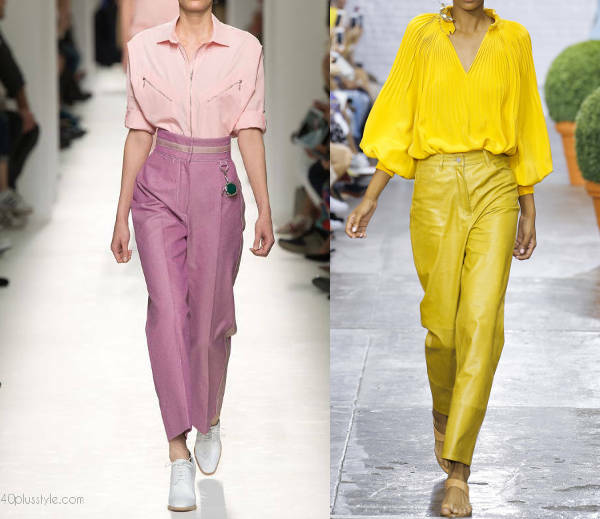 Lengthen the look of your legs by using the darker, richer color for your pants or bottoms. Wear shoes in your skin tone color or in a similar color to your pants or skirt. Add a bold jacket or cardigan to lengthen you, add structure and hide your belly. Stick to one color from the waist or hip area down so you don’t chop yourself up. 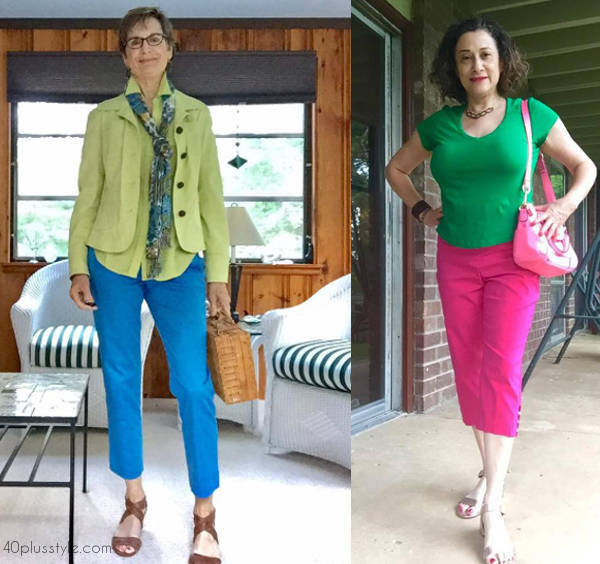 Now that you have some guidance on how to color block, give it a try and post your looks in our Facebook group or on Instagram, hashtag #40plusstyle. Here are some fun items in stores now worth adding to your color blocking mix. What colors will you mix and match? P.S. : Want to get very detailed guidance on color and finding your best neutrals and color palette? You will love this month’s training on color in the 40+Style Club given by color expert Ruth Essex. You can join here for instant access. Oh I love these posts about colours, colour blocking and proportions. No matter how many tutorials I get on these subjects, I am still not good at it. So I am going to earmark this post.